WTPA2 is a precise and weird 8-bit audio sampler kit which does some stuff that no other samplers out there do. It’s the logical progression of WTPA1, which sold out years ago. Manuals and source code are here! See what the nerd posse is saying about it here! WTPA2 can permanently store samples on a micro-SD card. WTPA2 has separate analog clocks for the two SRAM sample banks, allowing LIVE samples to be pitched independently. WTPA2 has up to three independent voices playing at a time, and MIDI channels for each. WTPA2 can stream samples from the SD card, drum-machine style. WTPA2’s main sample clock is a VCO which is easily controlled with modular synth control voltages. WTPA2’s code is tighter, and the max sample rate has increased. WTPA2’s has an audio bootloader which allows you to update your firmware by simply playing an AIFF into the sampler. WTPA2 has a new parameter encoder, has more buttons, and a generally has more powerful UI than WTPA1. WTPA2 has more effects and the old ones play nicer together. WTPA2 has no surface mount components. WTPA2 has a bunch of mods you can buy. WTPA2 is made to be more easily mounted in an enclosure. The fully tricked out WTPA2 looks sick, if I don’t mind saying. And, here’s the dewey-eyed mission statement about WTPA1. I know it sounds like I’m trying to be all noble, but I really did mean it at the time. WTPA is designed to the following aesthetic ends: to be a good and clear example of fairly “traditional” analog (low noise, relatively low frequency, high headroom, good routing, sensible ADCs and DACs etc) and digital (clean low level code, parallel memory architecture, I/O expansion via latches, various serial communication protocols) circuit design, and is catered to the determined (though not necessarily experienced) kit-builder who really, truly wants to learn more about how electronics work and how to get better at their craft. It is not the easiest kit ever, but for what it is I feel it’s versatile and powerful and (I hope) cool. And it comes with a thick manual. 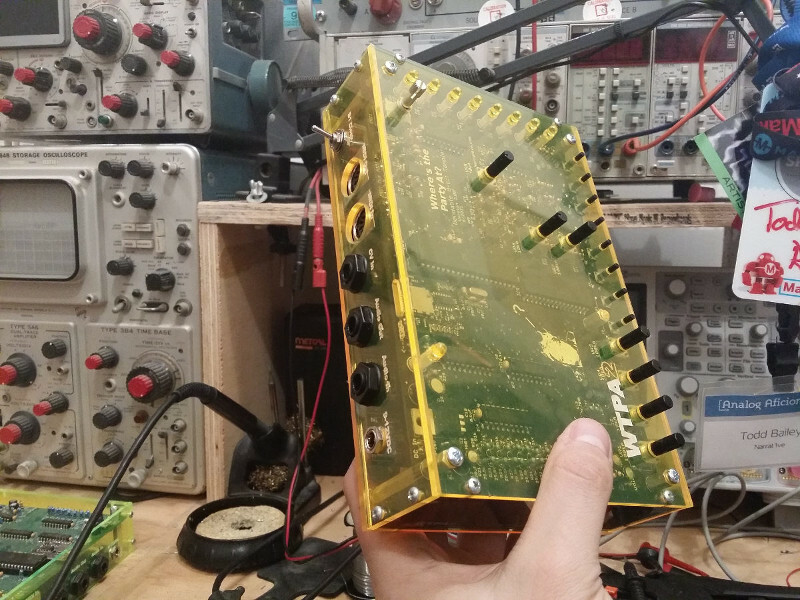 As a SAMPLER and INSTRUMENT, WTPA is designed to the following aesthetic ends: to capitalize on the audio flaws and interfacing ability that relatively powerful and perfect computer samplers could but usually don’t. To do crusty, awesome things that proletariat guitar garbage like the Line-6 pedals never will. To be a top-flight uncompromising, un-crashing piece of open source engineering that is more reliable than my well-loved but ever-so-buggy MPC2000. WTPA is nerdy and proud. WTPA1 originally started as a pedagogical tool for the Bent Festival in 2008.